Combine broth and pepper in medium saucepan; bring to a boil over medium-high heat. Reduce heat and keep broth simmering. Spray large saucepan with cooking spray; heat over medium-low heat. Add rice; cook and stir 1 minute. Stir 2/3 cup hot broth into saucepan; cook, stirring constantly, until broth is absorbed. Remove from heat; stir in cheese and lemon peel. 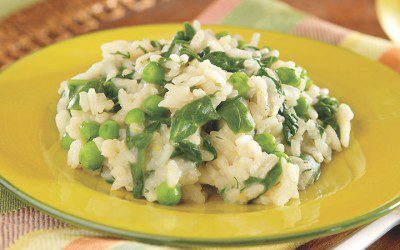 Note: Arborio rice, an Italian-grown short-grain rice, has large, plump grains with a delicious nutty taste. It is traditionally used for risotto dishes because its high starch content produces a creamy texture. Serving size: 1/2 cup risotto. Exchanges per serving: 2 Bread/Starch, 1/2 Meat.